Tyrol – a region full of contrasts. Embedded in the impressive mountain scenery, a new urban landscape is emerging: TirolCITY. 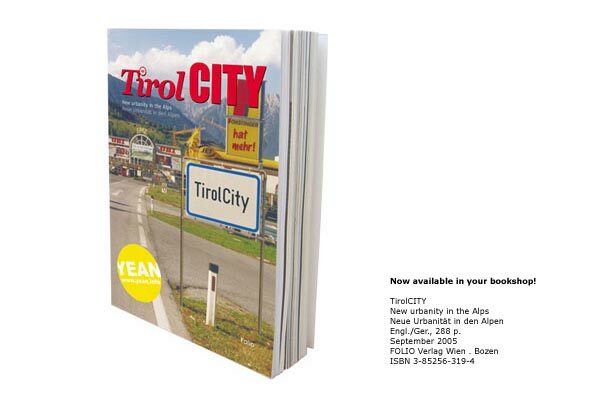 TirolCITY presents the ‘Land im Gebirg’ – Land in the Mountains – as a continuous conurbation. In particular, the ‘Inntal’ and its adjoining valleys display some of the characteristic features of urban agglomerations: high density, infrastructural and economic complexity and functional differentiation. While the historic centres have long stagnated as pedestrian precincts, a mixture of shopping, leisure, industrial, and residential zones is filling up the spaces in between those centres. The book anticipates on the new image of the Tyrol in texts, graphics and photographs, and provides external contributions from Yona Friedman, David Hamers, Winy Maas, Wolfgang Pfefferkorn and Arno Ritter. Now available in your bookshop!